Arsenic contamination of groundwater is a problem in many areas of the world, including Arizona. Exposure to arsenic in drinking water has been linked to negative health effects including cancer. Yet in many places, populations have little choice but to continue drinking arsenic contaminated water and in some places the problem is getting worse. The World Health Organization (WHO) estimates that the water sources of over 200 million people worldwide contain arsenic concentrations that exceed the recommended drinking water limit. This problem is perhaps most severe in the southeastern Asia, but groundwater systems in the Rocky Mountains and the Interior Plains in the western United States also have high arsenic concentrations. Groundwater contamination can originate from human activities; however, contamination of aquifers with arsenic often occurs naturally. Arsenic is associated with a variety of mineralized granitic and volcanic rocks and sedimentary rocks derived from those mineralized zones. Arsenic contamination of water occurs when geochemical conditions favor its dissolution from the solid aquifer materials. Its concentration and mobilization through groundwater depend on geological characteristics of the soil, aquifer, and bedrock. Aquifers in the Southwest United States are highly vulnerable to arsenic contamination due to geologic and climate conditions. Low precipitation rates and high evapotranspiration translate into slow aquifer recharge, and prolonged contact with arsenic-bearing aquifer materials allows dissolved arsenic in groundwater to reach high concentrations. A study conducted by the U.S. Geological Survey (USGS) in the main aquifers in the southwestern United States found that about 19 percent of the drinking water wells sampled exceeded the maximum contaminant level (MCL) for arsenic of 10 μg/L established by the U.S. Environmental Protection Agency (EPA). In order to develop a regional understanding of groundwater contamination across the Southwest, the National Water- Quality Assessment (NAWQA) Program of the USGS developed a statistical model that provides estimates of arsenic concentrations in areas where measurements are not available. Predicted arsenic concentrations are higher in areas with low recharge rates that are surrounded by volcanic and crystalline bedrock near the upper basin margins and basin low-lands surrounded by carbonate and clastic sedimentary rocks. While the study found that most arsenic contamination occurs in rural areas, the NAWQA model also predicts high levels of arsenic within the metropolitan areas of Albuquerque (NM) Bakersfield, Sacramento and Stockton (CA), Phoenix (AZ), Reno (NV), and Salt Lake City (UT) which could affect future groundwater development as these cities grow. Even though arsenic in groundwater is primarily derived from natural sources, human related activities can aggravate the problem. In Kolkata, West Bengal, India, groundwater is perhaps the most important source of water for the nearly 15 million people living within the metropolitan area. A study conducted by Kolkata’s Indian Association for the Cultivation of Science found that arsenic contamination, once limited to central, southeast, and western regions of the city, is now spreading towards the north-central areas. The study concludes that the rapid urbanization in Kolkata has decreased groundwater replenishment rates, decreasing groundwater levels and increasing arsenic concentration in the groundwater. These issues are being studied all over the world. 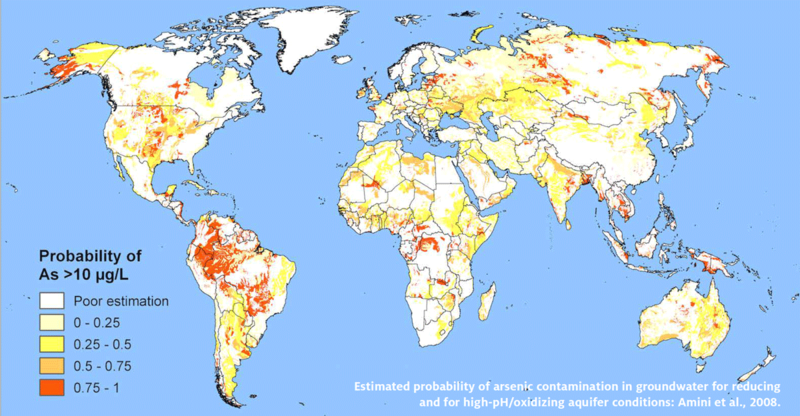 Over-pumping of groundwater, particularly in cities built on river deltas, may contribute to increased arsenic concentrations in surface aquifers. According to a new study from scientists at Columbia University’s Lamont-Doherty Earth Observatory, MIT, and Hanoi University of Science, large-scale groundwater pumping has reversed the natural flow of water in some areas so that rivers that once were fed by groundwater now recharge aquifers. In areas where surface water and riverbed sediments have a high arsenic concentration, such as the Red River in Vietnam, arsenic seeps into aquifers affecting communities that rely on these groundwater sources. A study conducted at Stanford University shows that the increasing irrigation rates in Cambodia, where groundwater is the preferred water supply, could worsen arsenic contamination and threaten domestic groundwater supplies for about 1.5 million people in Vietnam. The WHO has reported that about 20 million people in Bangladesh are exposed to arsenic in their water supplies. While naturally occurring arsenic is high in shallow aquifers (less than 200 feet), deep wells (greater than 500 feet) have also shown high levels of arsenic, particularly in areas surrounding Dhaka, the capital of Bangladesh. 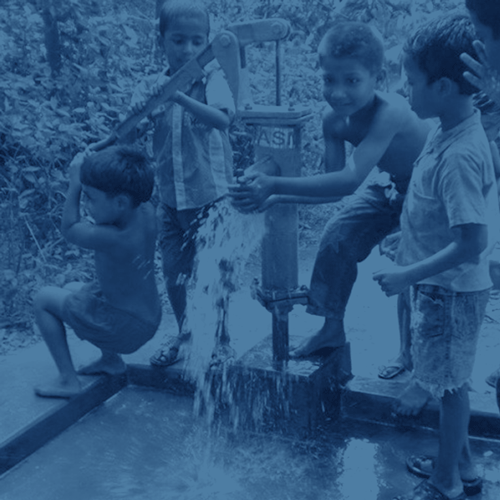 University of Delaware researchers found that the current groundwater pumping rates in Dhaka have forced shallow groundwater, where arsenic is found, to migrate to deeper areas of the aquifer affecting deep wells outside the city limits. Here in Arizona, many communities are grappling with arsenic issues. The vulnerability to arsenic exposure is high for the Navajo Nation population living in rural and geographically remote areas with limited water infrastructure. With a long history of mining operations, the lands of the Navajo Nation in the Four Corners area of the southwestern United States contain more than 500 abandoned mines with uranium, arsenic, and other metals. In an effort to help address this issue, the EPA has recently granted the Navajo Nation $3.71 million to fund two water line extension projects that will pipe water to nearly 100 homes in rural areas. About three quarters of the population on the Hopi Reservation live in areas, such as the community of Sichomovi, which have water resources with twice the EPA limit for arsenic in drinking water. High cancer rates on the Hopi reservation have been reported and preoccupy the Hopi population. Even though they are aware of the presence of arsenic in their water sources, the struggle to fund projects that would guarantee safe drinking water has prolonged their exposure to this toxic metal. The EPA awarded the tribe about $6 million to drill two deep water wells, however, the tribe requires an extra $18 to $20 million to complete the project. Many small water companies have struggled over the past decade with the high costs of bringing their systems into compliance with the EPA’s standard, which were revised in 2006 from 50 μg/L to the current level of 10 μg/L. Removal of arsenic is typically achieved through an initial arsenic oxidation process followed by physical removal techniques such as filtration and coagulation-flocculation processes. The City of Surprise, Arizona (population approximately 120,000) has an arsenic treatment facility that uses a coagulation and filtration process to reduce the natural-occurring arsenic levels in water from its groundwater wells. Chemicals that induce formation of particles with the arsenic are added to water from the wells and a series of filters then removes the particles. The Town of Sahuarita (population approximately 25,000), on the other hand, chose to use a proprietary (Layne) resin-based adsorbtion method that minimized the demands on staff for operations and maintenance. Researchers have achieved a broad understanding of the occurrence and mobilization of arsenic in groundwater systems. New and more efficient treatment options have been extensively investigated; however, the costs to cover the required physical infrastructure and equipment are often unaffordable. Technological innovations, developed recently or under development, seek to provide countries such as Bangladesh, India, and Vietnam with simple, low-cost arsenic removal. Some of these technologies have also been used by small communities in the United States. For example, at the University of Arizona, a team of scientists has combined a water purification technique called membrane distillation with solar panels to create a low-cost system that can be deployed on the Navajo. They are working with Navajo water users to construct a system that is easily operated and maintained by the community. A new technology, electrochemical arsenic removal, was tested by the developer, SimpleWater, in collaboration with the University of California, Berkeley and Lawrence Berkeley National Laboratory, on small community water systems in the United States as an inexpensive method to remove arsenic and other contaminants. Research is providing many effective methods, but large-scale adoption lags. There is no known way to cure chronic arsenic poisoning, which makes solving the problem of arsenic in drinking water a critical issue for millions of people worldwide. More effort is needed to carry innovations from laboratory to use.